New listingCountry Casuals cardigan size L, black with scalloped detail and front pockets. 95% silk 5% cashmere in good used condition Country Casuals fine knit jumper silk cashmere Pink S Sweater Round Neck. Condition is Used. Dispatched with Royal Mail 2nd Class. A lovely quality jacket/cardigan from Country Casuals that remains in beautiful condition. No marks, holes etc. Fastens with an off-centre zip with stud fastener above. Two zipped pockets. Has a nice ‘ridged’ finish. 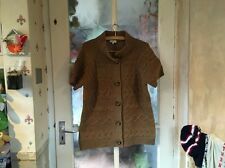 Country Casuals Ladies Wool Blend Short Sleeved Cardigan, Beautiful Condition. What we have here is a stunning country Casuals ladies wool blend short sleeves Cardigan in a size large. It is in beautiful condition. Brand new with tags (no tag on Cardigan) Size medium which according to size guide on Country Casuals website is a 14/16 Measurements for Jumper - Length 23" Bust 38" has stretch to it Cardigan length 27.5"
THIS IS A LOVELY OPEN FRONT CARDIGAN FROM COUNTRY CASUAL IN EXCELLENT CONDITION. Ladies CC Country Casuals White/Black Cozy Striped Woman’s Jumper Sweater Size M Cute casual knit. COUNTRY CASUALS Striped Jumper. White and Wheat striped Top with plain White back and long sleeves. This item is a country casuals deep purple evening cardigan. It has single fastening and 3/4 length sleeves. It is beaded down the front. It is uk 10, it measures 19” from pit to pit and 26” from shoulder to hem. It is in good, used condition. Lovely soft and warm cardigan with ribbon and beaded detail.Small one button fastening.Ideal for evening wear.Last photo is closest in colour.Length is 25". COUNTRY CASUALS. PRETTY LADIES JUMPER. 3/4 LENGTH SLEEVES. Country Casuals. Ladies Elegant fine knit jumper. 65% viscose/35% nylon. Beautifully embellished around neckline with dainty beads. This is a lovely country casuals jumper, it's cream and beige stripe and has 3 buttons on the top of each shoulder these buttons are just for show. The jumper is a size small. Country Casuals Petite Wool Alpaca Blend Cardigan. Material: 12% Wool, 11% Alpaca, 70% Acrylic, 7% Nylon. Cardigan Details Super soft and cosy. Country Casuals Pink Summer Cardigan M/L/Cotton-Wool blend/superb quality & cond. Condition is Used. Dispatched with Royal Mail 1st Class. Country Casuals - ladies jumper - size S. 3/4 sleeved thin knit jumper in beige and light blue with a square and stripe pattern. COUNTRY CASUALS. Lovely black bolero tie front top with beautiful beaded trim around the sides, bottom & sleeves. A quality dark red single button cardigan by Country Casuals. Size: L Large (14 UK approx). Country Casuals. Purple animal print cardigan. Beautiful, stylish & useful jumper. SIZE: L - UK 14. From armpit to armpit: 52.07cm/20.5". Length (top of shoulder to hem): 59.69cm/23.5". NICE AND ROOMLY 16/18 SIZE CABLE TOP AND RIB ON THE EDGING. 3/4 LENGTH SLEEVES. IN A CHARCOAL GREY SHADE. 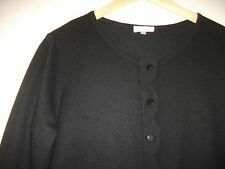 Country Casuals Cashmere Blend Cardigan Size M RRSP £70. NEW. RRSP was £70 however I paid £50 in the sale. Grey blend. 3/4 sleeves with button front fastening. Lovely classy looking Top. Country Casuals jumper size S New without tags Beige and cream striped cable knit stretch jumper. 40% cotton 30% viscose 20% nylon 10% angora. Lovely warm jumper by Country Casuals. Khaki green, ribbed chunky effect with detail. Hand wash only. Polo neck and long sleeved. Large plus78% Viscose, 22% Acrylic mix. Real christmassy style jumper. wool blend. A quality grey cardigan by Country Casuals. Size: XL (22 24 UK Approx). Length: 29". Super cute cardigan in a fabulous cerise pink shade! 4 centre front decorative cork buttons are attached with pink grosgrain ribbon. 50% linen, 50% cotton. Slightly shaped at waist and plain knit "skirt" flares gently to hem. 35% cotton 28% nylon 26% viscose. 17 ” pi t to pit. Smart, stretchy kn it te d to p. Condition is Used.